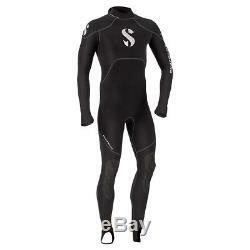 Scubapro Tropical Steamer 1mm Men's Wetsuit. The lightweight Tropical 1mm steamer offers just the right amount of protection for fun in the tropics. Delivering optimal comfort and flexibility for warm water divers, the suit features Everflex styling and 1mm neoprene with stretch fabric, plus a plush torso lining and anti-abrasion panels on shoulders and knees. Offering the perfect level of full-body protection without bulkiness, its design and construction makes it super affordable for tropical diving or any watersport activity. Made from 100% Everflex neoprene, an X-Foam formulation, for durability and better health. This EverFlex suit uses X-Foam Nylon-2 Neoprene an exclusive Scubapro formula. X-Foam is the only formula which complies with very strict P. (Polycyclic Aromatic Hydrocarbons) is found in many things, including petroleum-based products. Scubapro is very encouraged to be able to offer this neoprene blend to better protects divers and our seas. Built to last with heavy-duty Tatex printed kneepads and shoulder patches provide superior anti-abrasion protection. All-EverFlex flat stitch construction plus interior torso lining material keeps you even warmer without bulkiness. Rear diagonal zipper with PVC patch makes easy work of donning and doffing the suit. Thumb loops and feet stirrups prevent ride-up when worn beneath a wetsuit. Suit weighs 1.2 lbs. (544 g), is black in color and available in multiple sizes. Scuba Pro Tropical Steamer 1mm Men's Wetsuit. Lightweight, EverFlex Nylon-2 Neoprene, Warm Water Suit. Doesn't Compromise on Features. Fits and Moves Naturally with Body. Delivers Unparalleled Comfort, Stretch and Flexibility. Super Affordable for Tropical Diving or Any Watersport Activity. 1mm EverFlex Nylon II Neoprene: Exclusive Scuba Pro Formula X-Foam Only Formula which Complies with very Strict P. (Polycyclic Aromatic Hydrocarbons) Better Protect Divers and Our-Seas. Plush Torso Lining for Increased Warmth. Heavy-Duty Tatex Printed Anti-Abrasion Panels-On-Shoulders and Knees. Diagonal Back Zipper with PVC Patch for Easy Self Donning and Doffing. Thumb Loops & Feet Stirrups Prevent Ride-Up when Worn Beneath Wetsuit. Diagonal Back Zipper with PVC Patch. Feedback is a very powerful tool. It gives sellers a reason to conduct business at the highest level of honesty & respect. Many years ago Leisure Pro was the first Internet-based divers supply company. We're still the number one store for scuba diving and snorkeling equipment. Thousands and thousands of satisfied customers swear by our service. Hours: Mon-Thu: 9:30-5:30, Friday: 9:30-12:30. The item "Scubapro Tropical Steamer 1mm Men's Wetsuit" is in sale since Thursday, December 14, 2017. This item is in the category "Sporting Goods\Water Sports\Wetsuits & Drysuits\Wetsuits\Men". The seller is "leisurepro" and is located in Elizabeth, New Jersey.